Volunteer Nick Ashton helps executive director Beth Lilly frame work for the annual Airport Show. Are you looking to be more involved with Atlanta's photographic arts community? Maybe you should consider joining APG's Volunteer Rewards Program. 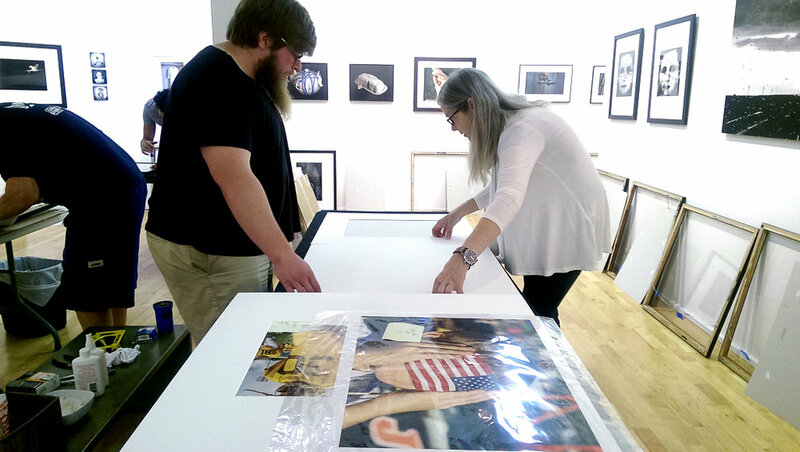 We always need folks to help install and de-install exhibitions, assist with receptions, and photograph openings and other events. If you'd like to be an important part of APG activities, please email us, and we'll find an opportunity that fits your schedule. And if you sign up for the Rewards Program, we'll keep track of the time, and for every 20 hours you volunteer, you can earn a free Membership or Call For Entry fee.